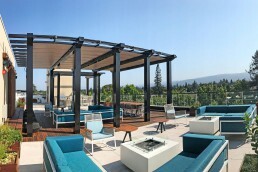 Appropriately named after the scenic views of the Santa Cruz mountains, Mountain View is touted as one of the best places to live in California. Located in the middle of the mountains and San Francisco Bay, this diverse community successfully accomplished the old adage of “mixing business with pleasure.” Not only is it home to many high technology companies including Google, but it also offers urban living at its best. 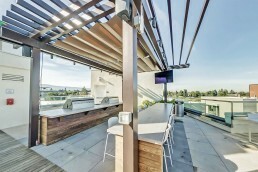 With this lifestyle in mind, Prometheus has been revolutionizing the housing industry, especially in the California Bay area. 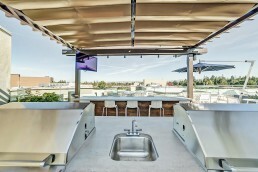 The modern design of the complex pays homage to California’s culture, history and scenic landscapes. 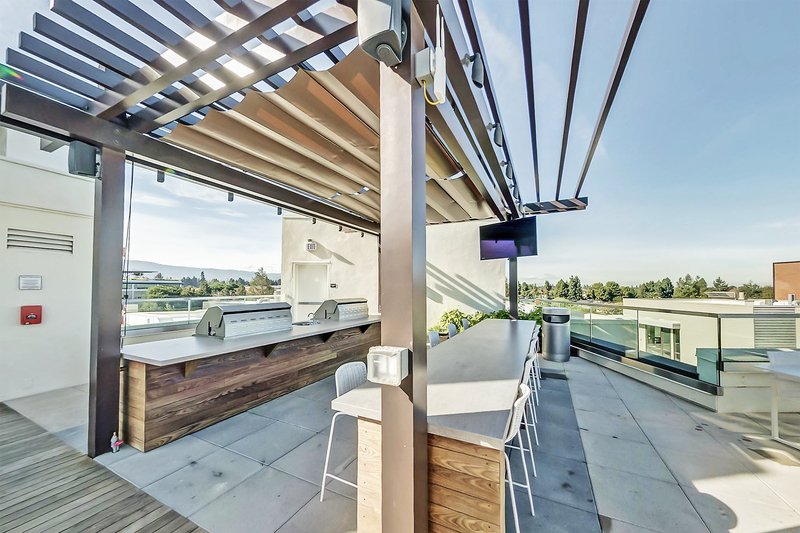 From the mountain mosaic in the Neighbor Lounge to the outdoor barbecues, 100 Moffett is the embodiment of California Cool. Prometheus developed 100 Moffett Apartments to feel like a vacation at home. Its luxury amenities include spacious windows, 10ft ceilings, a pool and spa and an inclusive fitness center with augmented tech. 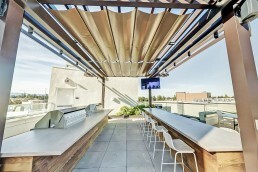 When residents want to catch some rays or take in the valley’s views, there is an expansive rooftop deck. 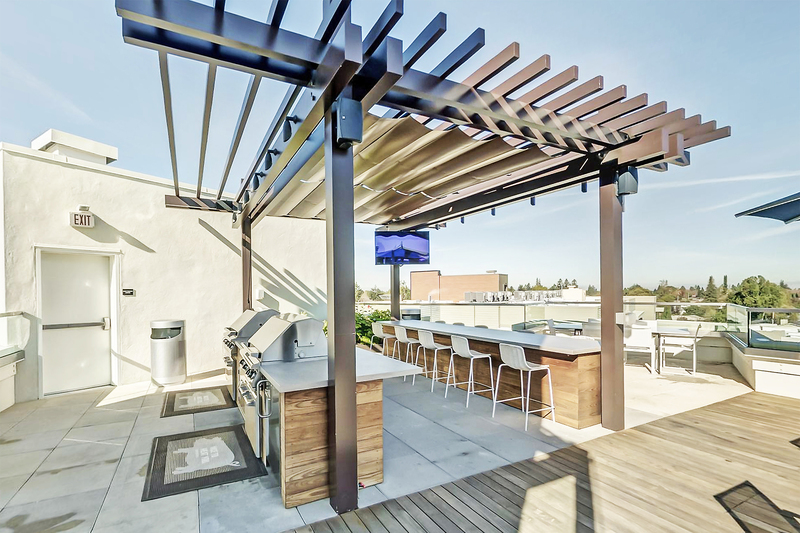 The outdoor space comes complete with two barbecue stations, a 10-seater bar, small television and a retractable shade for sun and rain protection. 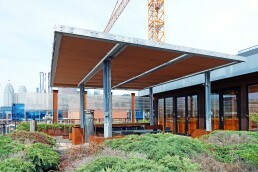 Known for its collaborative building process, Deacon Construction engaged ShadeFX to provide a versatile shade solution. Using a waterproof and fire-retardant fabric in Ennis Cocoa, two 10’x8’ rope-operated canopies were installed to complement the brown steel structure. “It was a pleasure working with Steve and ShadeFX. 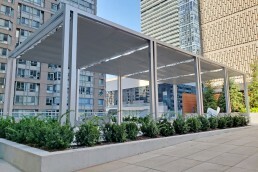 Throughout the project their communication and responsiveness were great and their canopies were easy to install. 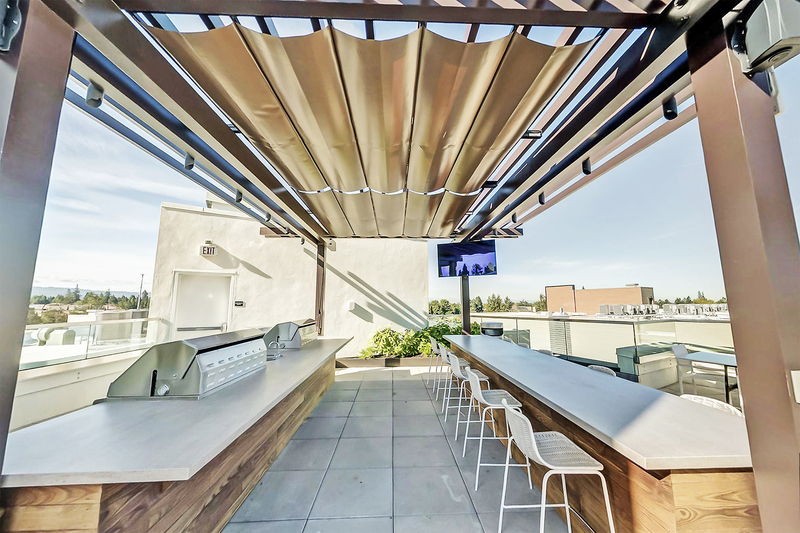 Whether relaxing around the fire pit or grabbing a bite to eat, the rooftop’s 360-degree views promote a peaceful atmosphere. These exclusive shaded spaces designed to reflect California’s laid-back culture, come together to paint a unique picture of modern apartment living. We can help you add your version of California Cool. Let us show you how.